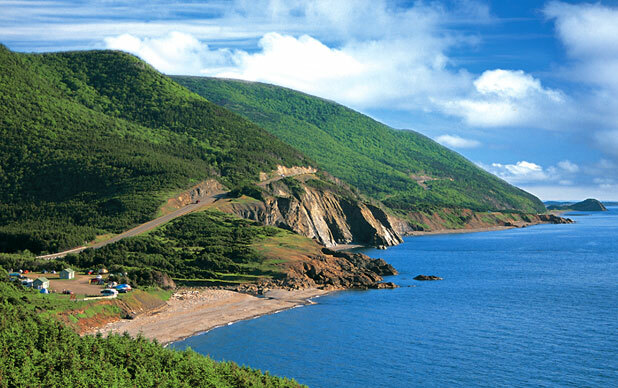 Cape Breton Island is one of Maritime Canada’s most scenic locales. The island has seen many colonists and as a result of its settlement by French, English, Irish and Scottish newcomers, a rich culture of music and tradition developed that is still present today. The original inhabitants are the people of the Mi’kmaq nation and today there are five First Nations reservations on the island. The best way to see Cape Breton is by car. Take a road trip along the Cabot trail, named for European explorer John Cabot who reportedly visited in 1497, which loops around the entire island. The scenery includes rocky coast and quaint towns and there are plenty of things to see along the route. Cape Breton was under the control of France during the 1600-1700s during which time they established Fort Louisbourg. Louisbourg is a fortified town that stands on a harbor that was considered militarily valuable by King Louis XIV and also became home to a bustling fishing industry. The town had a population of almost 3000, about 700 of whom were garrisoned soldiers. During the 1960s the fortress was rebuilt from ruins and it is now a Parks Canada historical site. There are more than 50 reconstructed buildings filled with period furniture and artifacts. Staff dress in period clothing and perform traditional tasks like cooking, black smithing, gardening and farming. After the commercial success of the telephone, Alexander Graham Bell bought land on Cape Breton for his summer home and research laboratory. He worked with Helen Keller and other hearing impaired individuals experimenting with hearing technologies, hydrofoil technologies, and animal husbandry. His estate is now a museum featuring his life’s work, a glimpse into his home life and beautiful grounds for picnicking or walking. For a taste of the island’s Acadian history, visit Cheticamp, also the island’s largest municipality (a whopping 3000 people). At Le Centre de la MiCareme you can see artists engaged in Cheticamp’s 200 year old tradition of mask-making. Check out the oceanfront boardwalk and stop into one of the ten restaurants in town, all serving Acadian fare. Hooked Rugs serves traditional fish cakes, meat pies and chiard from traditionally dressed waitresses, and after dinner you can check out the museum dedicated to the craft of rug hooking (for which Cheticamp is famous). If you’re willing to drive a little out of the way, at Cabot’s Bay you can take a whale-watching trip and see some fantastic scenery.